Libertarian-leaning organizations and those benefiting from longstanding U.S. trade policies have been sharply critical of President Trump’s trade policies. According to reporting by NewsMax, Hooks also specifically called out Trump’s no-compromise style. James Davis, a spokesman for the Koch network, criticized the $12 billion Trump has pledged in aid to farmers hurt by falling commodity prices triggered by the president’s expanding trade war with China, Canada and other countries who are significant purchasers of U.S. pork, soybeans and other agricultural products. But if you actually listen to what President Trump is saying about his trade goals, someone winning and someone else losing is not what he is aiming for at all. The only losers in such a new trade arrangement are the Russians who wish to monopolize the European energy market and rent-seeking corporations and special interests who currently enjoy subsidies or special treatment at the expense of taxpayers, competitors and consumers. We doubt anyone can keep a straight face for long while defending policies that protect the Russians and rent-seeking special interests. Here’s the model that Trump and Junker agreed to and some suggestions as to who the “winners and losers” might be, so you can decide for yourself if that’s a bad thing for America’s consumers, taxpayers and national security. First, the US and the EU will work together toward zero tariffs, zero non-tariff barriers, and zero subsidies on non-automotive industrial goods. We should be able to agree that no tariffs and no subsidies is a good deal for both sides. The EU will also reduce barriers and increase trade of American soybeans. Both countries will work to reduce barriers and increase trade in services, chemicals, pharmaceuticals, and medical products, again a good deal for consumers and taxpayers on both sides of the Atlantic. This will help diversify Europe’s energy supply and strengthen the strategic cooperation between America and Europe, and in the process break the Russian attempt to monopolize the European energy market. Such an agreement is a good deal for American energy producers, a good deal for European consumers and contributes to the national security interests of Europe and the United States. Some of the biggest obstacles to free trade are so-called non-tariff barriers to trade; bureaucratic rules and regulations that impose burdens on foreign goods that have no purpose other than to advantage domestic products and disadvantage imports. Trump and Junker agreed to launch a close dialogue on standards and regulations to promote trade, reduce bureaucratic obstacles, and dramatically slash costs for exporters. Again, who wins if non-tariff barriers to trade are eliminated? Consumers on both sides of the transaction. Fourth, Trump and Junker agreed to join forces with like-minded partners and address unfair trade practices. This may be the most important part of the agreement. Most, but not all, of the points in this part of the agreement are aimed at China. Getting the EU to join us in fighting Chinese economic warfare is a major national security coup, as well as an important contribution to the economic future of American businesses and inventors who have been victimized by Chinese trade practices. As USA Today’s Adam Shell observed in a recent column, economists say there are no winners in a trade war, and American farmers, appliance companies and automakers are proof that tariffs can inflict financial harm. Shell reports the tariff dispute comes at a time when the U.S. economy is performing extremely well, according to Kate Warne, investment strategist at St. Louis-based brokerage Edward Jones. And that enables President Donald Trump to negotiate a better deal from a position of strength. Corporate profits are on track to grow by more than 20 percent for the second consecutive quarter, its best back-to-back performance since 2010 reports Shell. The U.S. jobless rate is at an 18-year low. And the economy is picking up, with economists forecasting second-quarter GDP growth of 4 percent, which would mark the fastest pace since 2014. China, as well as Europe and Japan, is experiencing slowing growth. If there was ever a time to press for the kind of free trade that conservative and libertarian-leaning politicians claim they are for it is now. 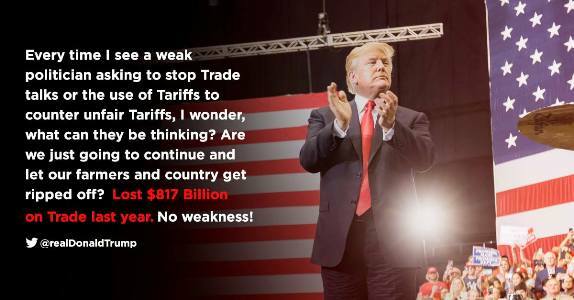 Trump’s plan to seek freer, fairer, and more reciprocal trade when the United States is in a strong, and growing stronger, economic position is in the best interest of America’s taxpayers, producers, consumers and national security. It may cause some temporary pain for some who have benefited from the current corrupt system, but Trump is playing a long game that in the end will benefit all American interests. Submitted by toddyo on Mon, 07/30/2018 - 14:06. Many folks saw Trump as one having a call from God. The mockers laughed, derided and cursed. They still do, even though they are confounded at every turn. The Koch Foundation is no different than most - taken over and administered by regressive progressives. Whatever good the Brothers show is drowned by misguided spokespeople.